In case you haven’t stopped by in a while, Surfers Paradise is having a serious moment. Once relegated as a place simply for tourists, nightclubs and events like the GC600, it’s undergoing a major facelift, and we’re really digging it. With places like The Island Rooftop, House Of Brews and the soon to open Taboo Tiki (from the gang at Aloha Dinning) taking up residence, Surfers is becoming the go-to place for good times. Adding to the growing community of cool is the brand spanking new venue White Rhino. 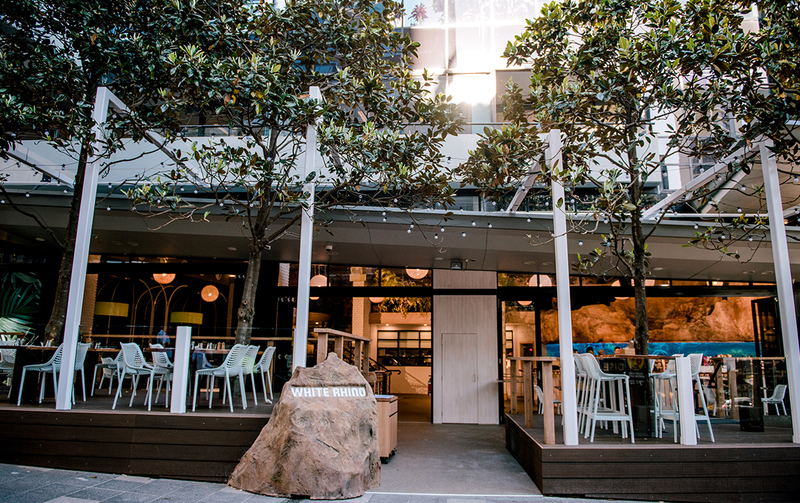 The $4 million bar and restaurant, located in the Circle On Cavill precinct, is sprawled over an impressive two levels. Stepping inside the space you can certainly understand the price tag. With a capacity of around 200 for lunch and dinner and over 500 standing, White Rhino is going to be absolute must do this summer on the Coast. The whole space aims to celebrate the GC weather, bringing the beautiful outdoors in, with white washed brick walls, cascading greenery, huge waterfall bar and floor to ceiling fold back windows. 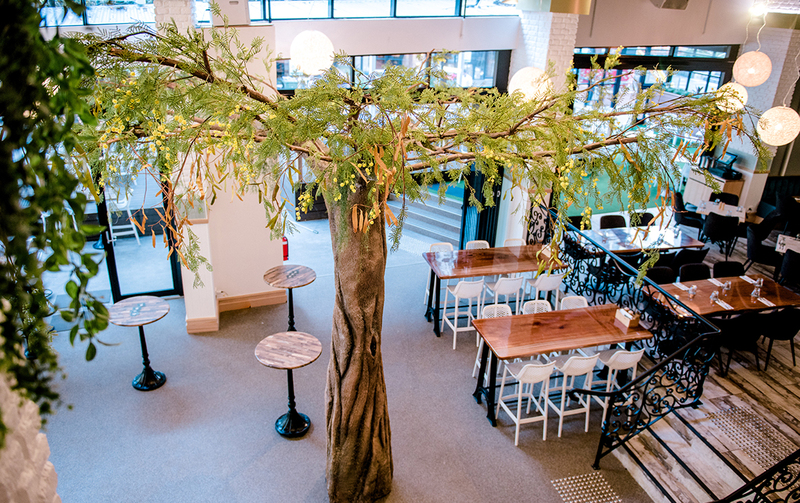 But the hero of the venue has to be the 5.5 metre tree that stands proudly in the middle of the room, curling up the ceiling and stretching out to the private mezzanine balcony. Speaking of which, the jewel-coloured suede booths, tropical wallpaper and art deco mirrors upstairs deserve their own moment. The mezzanine is available for private bookings with bottle service. Hello epic birthday party. Downstairs there’s a more formal dining area that you can book for lunch and dinner. The dark wood tables, swanky booths and giant birdcages make it totally ‘gram worthy. 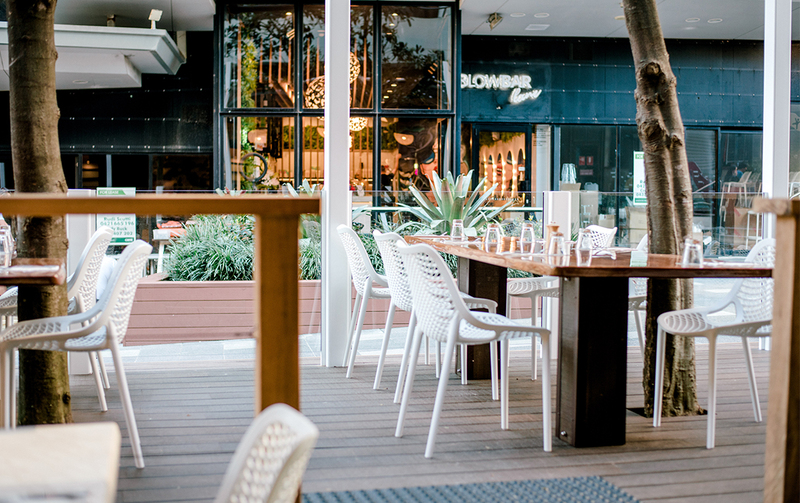 The vibe here is a little something for everyone, while the dining area is more like an upmarket gastro pub, there’s also a large casual seating area with bar tables aplenty that flow onto a huge deck area, complete with fairy lights woven through the trees. 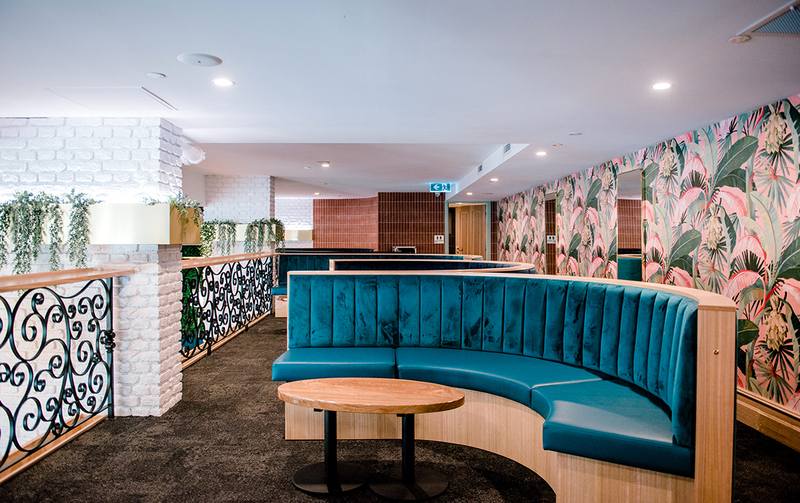 The menu designed with the help of head chef Adam Dundas Taylor, formerly of Nobu Mayfair and Jamie Oliver’s Fifteen in London, is modern Australian. It’s full fresh local ingredients with a big emphasis on seafood. Case in point, the chilli bug linguini. 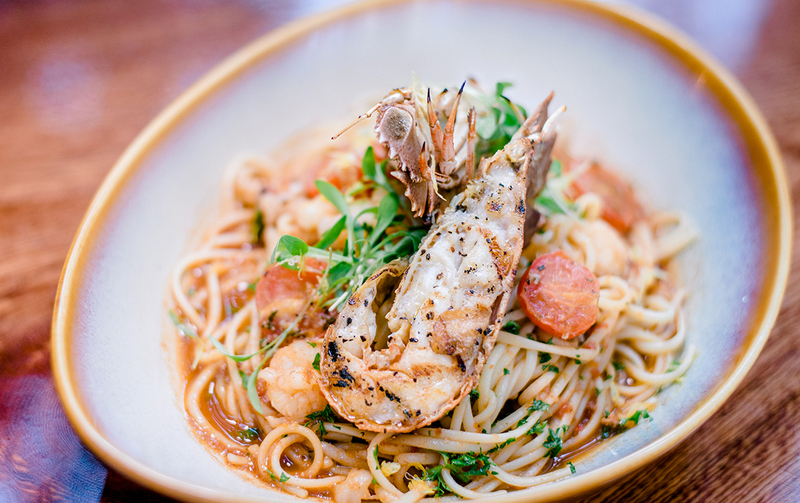 With juicy Moreton Bay bugs tossed in a brandy and seafood stock reduction, it’s zingy and perfect with glass of white. Another winner is the crispy skin New Zealand King Ora salmon, pan seared with chilli zucchini and pomegranate seeds. It’s the ultimate summer dish. 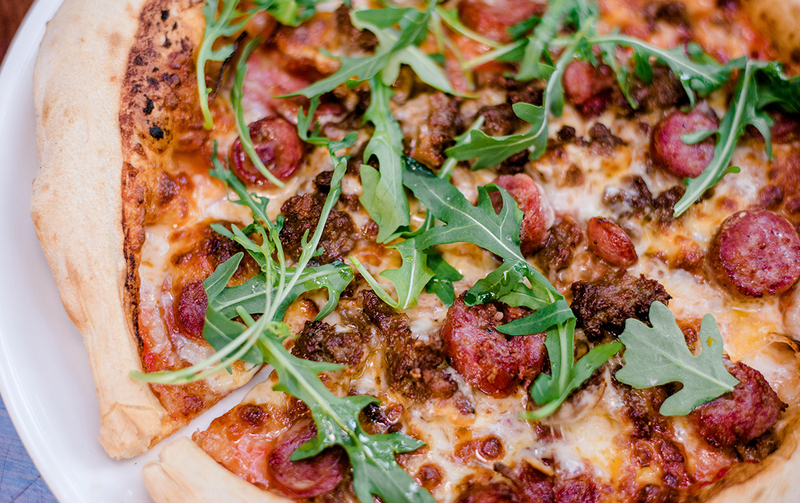 If you’re after a more casual affair you can’t go past the White Rhino Pizza with pork and fennel sausage, salami, fior di latte and rocket. But if you really want to push the boat out, grab the Signature First Class Pizza with five whole Moreton Bay bug tails drizzled with a sharp yuzu sauce. After something a little lighter? Grab the broccoli salad with fregola, puffed wild rice, toasted almonds and lemon yoghurt. Trust us, you’ll absolutely want to eat all your greens when it comes to this dish. 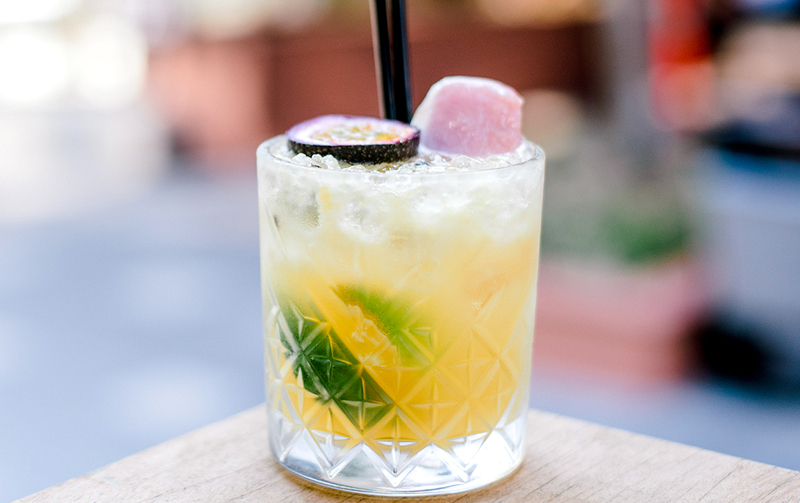 Tipple-wise, there’s an extensive cocktail list, we suggest the Weis Bar—passionfruit puree, Leblon Cachaca and of course an ice-cream sticking out the top. Oh and did we mention, they’re serving drinks from 10am, that means a boozy brunch is on cards when the brekky menu rolls out shortly. This is kind of the place you can bring everyone from your pals for post work cocktails to your parents for a special lunch. The White Rhino opens next Friday 2 November and will be open seven days a week, 7am till 1am. Keen to discover more rad new openings in the area? Get excited for Taboo Tiki.